James Maskalyk told a Kelowna audience they can make a difference in global events. 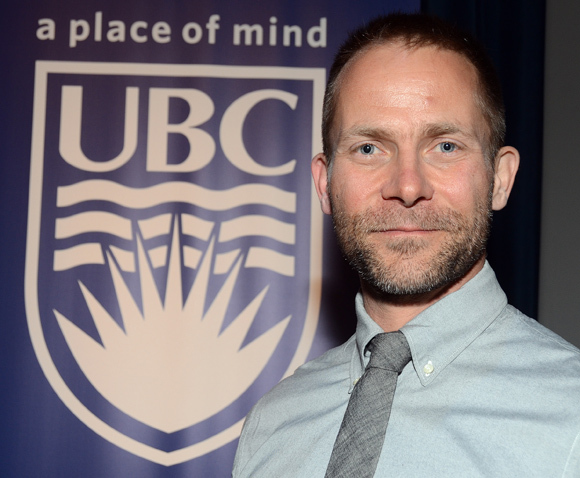 The best-selling author was at the Kelowna Community Theatre Tuesday as part of UBC's Distinguished Speaker Series. James Maskalyk has witnessed first-hand the inhumanity war brings to innocent people. And he brought those stories to Kelowna Tuesday as part of the Distinguished Speaker Series, presented by UBC's Irving K. Barber School of Arts and Sciences. Maskalyk first set out for the contested border town of Abyei, Sudan, in 2007 with Médecins Sans Frontières (Doctors Without Borders/MSF) as the newest medical doctor in the field. His third and most recent mission with the group led him to the Kenyan refugee centre in Dadaab, the largest refugee centre in the world, where he spent six months helping those in need. He told the audience of several hundred the problems in Sudan and other hot spots around the world can be fixed. “There is no substitute for actually doing something,” he says. “There is no substitute for having the tools to really engage. People are hungry to be brought closer to the world, even its hard parts. I went to Sudan, and am writing about it again, because I believe that which separates action from inaction is the same thing that separated me from my friends. It is not indifference. It is distance. May it fall away." Maskalyk says people do not have to pack up and head to Africa to make a difference. “You can give 10 per cent of your money or your time for 10 years, then you are at 100 per cent,” he says, adding NGO, non-government agencies, are gaining momentum around the world and they operate without a political or financial agenda. He also encouraged people to be catalysts for change. “Together, you are unstoppable,” he says, adding action like the Occupy Movement is only the beginning. Equipped with his experience from working as an emergency room physician and his desire to understand the hardest parts of the world, Maskalyk was drawn to the war-torn regions of the world and knows of what he speaks. While in Sudan, the doctor, who is originally from a small town in northern Alberta, spent his days treating malnourished children, fending off a measles epidemic and staying out of the soldiers’ way. Worn raw in the struggle to meet overwhelming needs with inadequate resources, he returned home six months later more affected by the experience, the people, and the place, than he had anticipated. He was MSF’s first official blogger, and from this, he published his best-selling book about his experience as a field physician, Six Months in Sudan. He is working on a second. Maskalyk currently practices emergency medicine at St. Michael's, Toronto’s inner-city hospital. He is an award-winning teacher at the University of Toronto, and an associate and founding editor of the open access medical journal Open Medicine. He is also director of a program that works with Ethiopian partners at Addis Ababa University to train East Africa's first emergency physicians.